Mission trips have gotten a lot of criticism. Some of that criticism is deserved: there are mission trip volunteers who focus on tourism instead of service; there are organizations that make poor use of the volunteers who come to serve with them. But these criticisms seem to rest on a single set of questions: are short term mission trips the most efficient ways for a group (or individual) to offer material assistance to a community? Could that week be spent for efficiently? Could the money used for the trip be spent more efficiently? The answers to those questions depend on a lot of factors that I don’t have time to look at here. But there’s something more important buried in these criticisms: mission trips aren’t just about efficiently providing material assistance. There are at least two other things that mission trips do that we should lift up. I would expect that knowledge to lead to resentment, but what Nadege told us was that for us to leave the comfort of our homes to be with the people of Haiti, even for a few days — that told them that they mattered. Over and over again, our hosts and translators told us how much it meant that we would leave our country to come spend time with them, to work with them, to support their ongoing labor for the future of their nation, their communities, and their children. The love and gratitude was and is overwhelming and humbling. Second, they serve as faith formation opportunities for the people who go on them. Mission trips are opportunities for participants to learn about the privileges they enjoy, the conditions in which others live, and how we are all connected through social and economic systems. They are opportunities to live out the call serve Christ by serving the least of his brothers and sisters. And they opportunities to help participants grow in service and learn to respond to all needs with empathy and compassion. When we look at mission trips solely as economic engines – as ways to transfer assets from one group to another – we lose sight of their total power, especially their ability to shape the lives of the volunteers in positive ways. We need to look at mission trips and other volunteer opportunities in their totality: acknowledging the bad, yes, but recognizing and building on the good. Every year I go back, I see visible, meaningful progress. The first year, they showed us a newly purchased piece of land where a high school was to be built. In 2014, there was a foundation with rebar sticking up out of it. In 2015, there was a beautiful new building filled with eagerly learning 7th graders. This year, there were 8th graders, a new library, and the foundation of a second building. This is what it means to be in it for the long haul, to see our paltry offering as part of a bigger picture. This post’s person I read is Maeve Strathy (and the other folks) at What Gives???. I’m writing about Maeve Strathy this week partly because I was critical of a post of hers early last week. The fact is that I like most of the content at What Gives???. Strathy and the other writers there provide rock solid advice on fundraising. And it’s advice that I think is particularly useful for small shops because it’s advice that often cuts to the quick of fundraising challenges. It’s advice that helps me do my work even when I don’t have a lot of resources – funding, staff, etc. – to put behind it. Moreover, and importantly, Strathy is willing to question her own assumptions and statements. She loves the idea of ‘donor love’. She’s also willing to say that it has its limits. She likes the idea of talking about beneficiaries as assets. She’s also willing to admit that she may not have communicated her idea as well as she would have liked. That’s something that I respect a lot, especially in an era when criticism tends to cause us to dig in deeper. So go read the folks at What Gives???. Especially if you’re looking to be an effective fundraiser in a small shop. 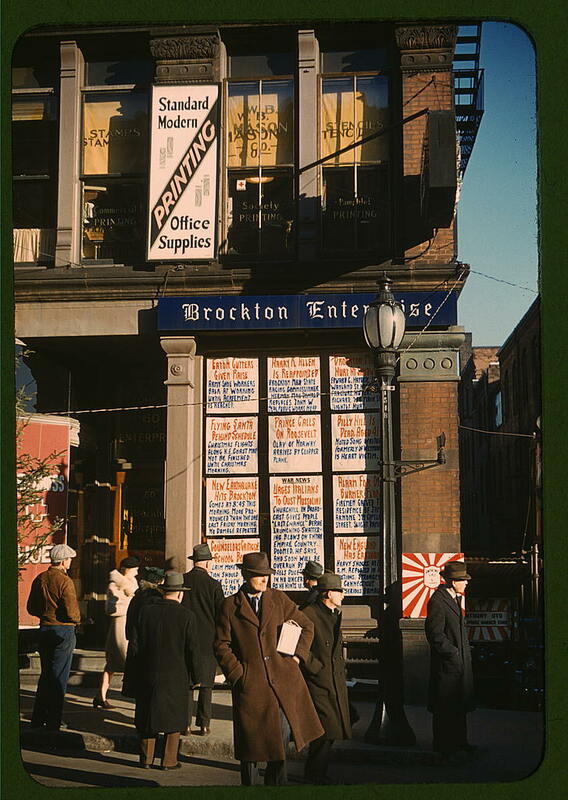 Library of Congress , "Headlines posted in street-corner window of newspaper off[ice] (Brockton Enterprise) ... Brockton, Mass. (LOC) via Flickr Commons Categories People I ReadTags Maeve Strathy, What Gives? Morgan Guyton: Let’s Start an Inclusive Evangelical Campus Ministry Network! The reason that I seek to purge my heart of the world’s idols is so that I can be radically hospitable to all people. I believe that Jesus’ call to take up my cross and follow him means to renounce my comfort and status to walk with the world’s crucified. Christian holiness as modeled by Jesus has the goal of solidarity, not sanctimony. So inclusivity does not amount to a sort of vapid tolerance of sin. I yearn to be liberated from all of my sin, not because I’m putting on a show of piety for a perfectionist God, but because I want to become a perfect vessel of the unconditional love that he has shown me. Bartolomé de las Casas started out a lot like Columbus. He was a wealthy adventurer who traveled to the New World, where he owned a large plantation with many slaves. Unlike Columbus, however, de las Casas underwent a radical transformation in his life. After witnessing the violent atrocities committed against the natives, he gave up his land, freed his slaves, became a priest, and spent the rest of his life fighting the brutal colonization of the New World… He is considered to be one of the first advocates for universal human rights. And if we’re going to celebrate de las Casas, I think there’s power in the fact that he repented. Let’s not remember de las Casas only for his work fighting for the equality of Native Americans, but for the fact that he admitted he was wrong and changed. I’m not sure, but it’s possible that realizing that other people have stories – and taking the time to listen to and understand those stories – might be the first step on the road to repentance.